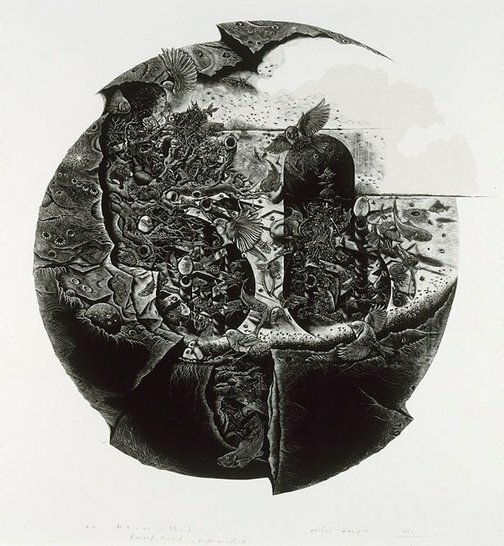 In this print, Kobayashi's sphere cracks apart to reveal a labyrinthine world in which birds, fish, mice, snails and various other insect and plant forms weave through and over man's decaying urban structures. Unlike many artists now who praise technology and covet the artificial and unnatural, Kobayashi genuinely seeks a return to nature alone. In commenting on this print he has said that modern civilisation, in going against the laws of nature, reminds him of the conceited creators of the tower of Babel; modern science aims at progress by defying nature but he seeks to follow the provisions of nature. Hence he uses wood to do his printing, reverting to wood-engraving, an unusual medium in modern Japan. As he applies his chisel to the wood, he loses himself in the rings of the boxwood which nature has taken hundreds of years to create, and then his work comes alive. In creating this print Kobayashi used ten blocks, each meticulously carved with his own surreal vision. He does believe however that if one hundred people viewed his print there would be one hundred different ways of appreciating it. Kobayashi was born in Kyoto, educated at the International Art Institute there, and now lives in Tokyo. Jackie Menzies, Contemporary Japanese Prints: The Urban Bonsai, 1992, pg. 57, 60. Signed and dated l.r., pecnil "Keisei Kobayashi 1991".